Jun. 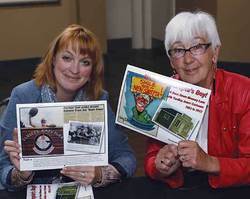 14, 2013 8:00 p.m.
Leduc County Councillor Jocelyn Mackay (on left) partnered up with Pearl Gregor of the New Sarepta Historical Society to sell a special 19 month calendar created just for the Society by world famous cartoonist, and New Sarepta's adopted son, Yardley Jones. The members of the New Sarepta Historical Society have taken on a huge challenge in order to digitize their immensely popular hardcover book "Looking Back: A Community History" and save it online so it can be accessed by everyone at no cost. "It's going to cost about $1,000.00 to get it online." shared Historical Society member Pearl Gregor. "We have a lot more planned than that but getting the book online is our first big project!" A lot more planned is right! Along with digitizing the book, the group is looking to add some commemorative street markers around the hamlet, complete a collection of enlarged historical photos for the Senior's Complex in the Agriplex expansion, fund a Founder's Memorial Wall Sculpture, and create a display to showcase the historical materials recently received from the Alberta Archives. When world renown cartoonist and the man who helped put New Sarepta on the map, Yardley Jones, heard about what the Historical Society was attempting to do, he immediately contributed his considerable artistic talents to the cause. Over the years Yardley has honoured his adopted home town with many mentions and caricatures about life in New Sarepta in his cartoons. He has now gifted some of these cartoons to the New Sarepta Historical Society who have created a 19 month calendar, which begins this month and goes until December of 2014, and all the proceeds from the sales of these calendars go directly to help fund these planned projects. "This is a one-of-a-kind calendar which will never be recreated." shared Pearl. "So any fan of Yardley's should get one while they can." The calendars sell for just $30.00 each, 2 for $55.00, or 3 or more for $25.00 each. There are a limited number available so anyone wishing to obtain a copy should contact Pearl at 780-941-2106. They will also be available at select events around the Leduc County area but as to which events there are currently no details at this time. However, once they are gone, they are gone, so don't miss out on a chance to own a little piece of local history and assist New Sarepta in achieving their goals!